A 2008 HBR article asked readers, “Is your organization a “learning organization?” The authors of the article posed this question almost two decades after MIT professor Peter Senge first coined the term. 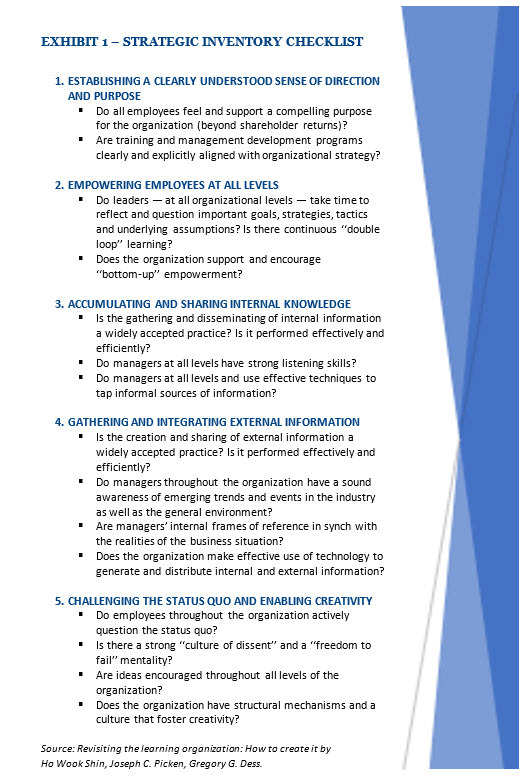 In Senge’s landmark book, “The Fifth Discipline”, he proposed five characteristics of a learning organization. In this post, we explore a new article along with its authors’ new construct of a learning organization, as well as some helpful resources to benchmark your organization. A new article published in Organizational Dynamics, entitled “Revisiting the learning organization: How to create it” by Ho Wook Shin et al makes the case that that smarter leaders are a necessary, but not sufficient condition to face today’s business challenges. Each of the five elements is discussed in detail leveraging case studies, research and other references to make the case for each element. They share five tools and techniques that can help an organization better understand their competitive environments. “What Are Learning Organizations, and What Do They Really Do?” by Warren Wilhelm. Chief Learning Officer, February 22, 2017. “Is Yours a Learning Organization?” David A. Garvin, Amy C. Edmondson and Francesca Gino. HBR, March 2008. Learning Organization Survey. As described in the article, “Is Yours a Learning Organization?” (Harvard Business Review, March 2008), this survey provides a starting point to help you assess how well your organization meets the criteria for being a learning organization. Use to benchmark your organization against that established in previous research by Garvin et al. “Revisiting the learning organization: How to create it” by Ho Wook Shin, Joseph C. Picken, Gregory G. Dess. Organizational Dynamics (2017) 46, 46-56. Kyoungshin Kim, Karen E. Watkins, Zhenqiu (Laura) Lu, (2017) “The impact of a learning organization on performance: Focusing on knowledge performance and financial performance”, European Journal of Training and Development, Vol. 41 Issue: 2, pp.177-193.